Pas 117, 2440 Geel, Belgien. Hotel Verlooy in Geel combines luxury, comfort and style of a large hotel with the added value of a smallscale setting, a friendly reception and a real personal service. Behind the strikingly-designed façade of Hotel Verlooy lies a world of taste and comfort. Internet ist kostenlos vorhanden.Es gibt Internetleistungen (Computers) in der Vorhalle (kostenlos). Mehr als 8 Tage vor Anreise : keine Annulierungkosten. Babybett: 20.00 € pro zusätzliches Bett. Starting the day with a lovely breakfast, straight from the ovens of the Verlooy bakery and patisserie. A morning overhere is the best possible start of a successful day. 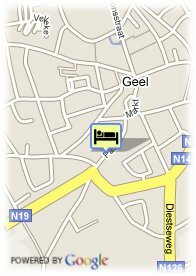 The hotel is situated in the city centre of Geel. There you can find several restaurants and brasseries who will offer you a well tasted lunch or diner. Hotel Verlooy is situated just a few minutes drive from the motorway E313. 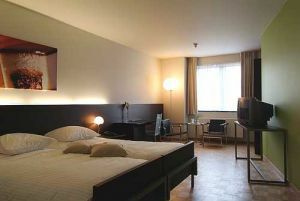 The hotel is 25 minutes drive from the big city Hasselt and 30 minutes drive from Antwerp.